Labor laws concerning wages are changing rapidly. Not only are federal and state labor departments increasing investigative resources, private wage-and-hour lawsuits are on the rise and costly to defend. 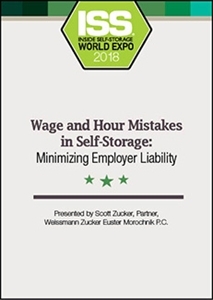 Our presenter will discuss areas of exposure facing self-storage owners. She’ll also offer suggestions on how to comply with wage requirements and minimize liability in the event of a lawsuit.